It's Friday night... What'cha doin', GT? 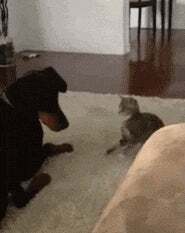 Gif is unrelated. I just love this one. That dog is insanely patient. Anyway. Come tell me about your evening! I'm home, hanging out with my cat in my bedroom, watching Guy's Grocery Games online, and trying to finish yet another half-finished project. I'm really bad about finishing things, this past year or so, and it's time to wind a few of them up. This one is a baby blanket I started for a friend when I found out she was pregnant... almost a year ago. Baby girl is now 4 months old. Oops! Husband went to the bar for a friend's birthday party. I was invited, but frankly, I'm not in the mood for dealing with drunk people and ear-shattering pop music. Also, my legs hurt :( Winter and I are not good friends. Other-Husband is long since asleep, my eldest is spending the night at a friend's house, and the rest of the crew is asleep, so it's relatively peaceful (for once!) I just heard Almost-BIL get dropped off, so I know he's home safe, which means Almost-MIL is also having a restful night. The show I'm watching has set off a lot of foodie thoughts (who, me? food obsessed? nah...) I'm actually thinking about writing a whole post about said thoughts, but I dunno... I feel like y'all are probably sick of hearing me natter on about food and cooking! What do you think... yea or nay on a food post?